Alberta's United Conservative Party Leader Jason Kenny compared the prime minister's political competence to a finger bowl in a Calgary Sun column published on May 16, 2018. OTTAWA — It's springtime and Conservatives at two levels have been hard at pre-election work, sowing a familiar message that Justin Trudeau is a "millionaire trust fund prime minister." 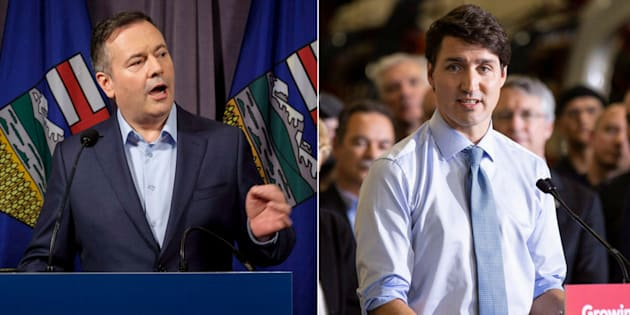 Jason Kenney, the former federal minister who now leads Alberta's United Conservative party, took those elitist jabs a step further by comparing the prime minister to a finger bowl in a Calgary Sun column published Wednesday. Yes, as in the shallow dish of lukewarm water — and, if you're ritzy, a lemon wedge — meant to clean any evidence of lavish dining off one's fingers during or after an upscale meal. United Conservative Party Leader Jason Kenney addresses supporters at an even in Calgary Lougheed on May 15, 2018. Kenney made the comparison to columnist Rick Bell in the wake of Trudeau's visit to Calgary Tuesday. After announcing a $1.53-billion pledge to fund the expansion of one of the city's light-rail transit lines, the prime minister was grilled by reporters for an update on the Kinder Morgan pipeline expansion project. Trudeau's answers about the government working "very, very hard, both visibly and behind the scenes" didn't comfort the UCP leader. Conservative MP Pierre Poilievre lobbed the same personal attack during question period last week, calling Trudeau an elite for having "spent much of his life living in government-owned mansions." Poilievre contrasted the prime minister's upbringing to the government's repeated messaging that it's serving on behalf of middle-class Canadians. Trudeau did not respond to the trust fund remark. Minutes later, Tory MP Ed Fast followed suit and accused the prime minister for being someone who doesn't care about tax hikes because he has a trust fund. The tactic of bringing up Trudeau's personal finances has been a go-to Tory method of supercharging criticism since it was utilized by former prime minister Stephen Harper more than three years ago. When asked by reporters to respond to Kenney's "finger bowl" burn, Alberta Premier Rachel Notley laughed and called the creative rip "ironic." Notley brought up comments Kenney made on Tuesday where he responded to heckling by invoking Michelle Obama in the Alberta legislature. "When they go low, we'll go high," he said. Stephen Harper speaks during question period in the House of Commons on Parliament Hill in Ottawa on April 22, 2015. Kenney also made the same comment earlier this month during his party's first convention where he asked delegates to heed the former U.S. first lady's advice. Notley said it's obvious the province's opposition leader has a "tremendous amount of personal hostility" towards Trudeau. "And I would suggest that anyone who is presenting themselves as being equipped to lead the province needs to learn very quickly to rise above his own personal hostilities," she said. "And that is not what we see demonstrated in the quotes that were reported today."